I believe that the review below highlights the hypocracy of the UN in its dealings with all countries in the Middle East and the constant "bashing" of Israel to the exclusion of all other countries. A Snapshot of Today’s United Nations, United...in bashing Israel. Here are some vital statistics on the current crisis in the Arab and Muslim world and the role not being played by the “global leader,” the United Nations. A month and a half ago, two-year old Wallah Omar arrived at Rambam Health Care Campus from Gaza City, listless, apathetic and completely paralyzed on her left side. Her condition was rapidly deteriorating, explained her distraught father, Ayad Hamis Omar. Wallah had been diagnosed in the Gaza hospital as having a large tumor that was pressing on her brain. The growth had to be removed, but her parents were hesitant about performing the surgery in the small local hospital. On the advice of her oncologist, Walla’s parents opted for what the doctor termed “the first hospital on his list,” Rambam. According to the child’s father, Ayad, the oncologist had likened medical care in Israel with that in the United States. “He told me, ‘Once your daughter will be in Rambam, everything will be fine, and your family can rest assured,’ ” said Ayad. Having decided that their daughter must get to Israel, Wallah’s parents obtained a letter of request from their local hospital and sent it to Rambam. Without hesitating, Director of Pediatric Hematology and Oncology, Prof Myriam Ben Arush, replied: Transfer Wallah to Rambam at once. Upon her arrival at Rambam, the child had an MRI scan, which showed that the tumor had reached the size of a large orange. Director of the Pediatric Neurosurgery Unit, Dr Joseph Guilburd operated immediately, removing the entire growth. Shortly after surgery, Wallah went home to Gaza for a week, and then returned to Rambam for a series of 30 radiation sessions, under the watchful eye of Rambam oncologist Dr Sergey Postovsky. Now a month at the hospital, she has finished the bulk of the treatments, which will be completed within a week. “She is recovering amazingly. She is perfect, laughing and playing,” says her relieved father, who adds that his daughter looks forward to seeing her sister, Dua, five, and brother, Ahmad, seven months old. Wallah’s story began four months ago, when she started vomiting. Her family doctor thought she had a stomach virus, which her family treated with common home remedies. The vomiting continued, and her situation was compounded by neurological problems: she was unable to move her fingers or even hold her spoon. Today, according to Wallah’s surgeon, Dr Guilburd, the girl’s chances for full recovery are very good. "To see a child who recovers so beautifully is a physician's greatest satisfaction," he says. The Children's Hospital at Rambam provides treatment in oncology, nephrology, orthopedics, cardiology, and neurosurgery to seven hundred children from throughout the Palestinian Authority annually. In past half year Rambam has treated 200 adults and children from Gaza alone, twice the number treated during the same period last year. Of these, 25 have been pediatric oncology cases. Says Prof Ben Arush, "Our department is really a microcosm of an ideal world: Jewish, Christian and Muslim children from all countries receive the best possible care." Even Judge Goldstone can support Israel??!! Most Israelis are suspicious of the UN Human Rights Council and its disproportionate focus on Israel. A good friend of mine wrote an op-ed in the American Thinker http://www.americanthinker.com/2011/02/judge_goldstone_contradicts_th.html which debates this problem. In this article he draws some small comfort for support from non other than Richard Goldstone. Israel has for years complained about the extreme bias of the UN Human Rights Council (HRC) which has issued 35 resolutions condemning Israel since 2006 and only 15 against all other countries in the same period. At a press conference in Jerusalem on February 11, UN High Commissioner for Human Rights, Navi Pillay denied reports that the HRC unfairly targets Israel. But Ms. Pillay's views are sharply contradicted by none other than Judge Richard Goldstone who headed the UN Mission to Gaza that produced the controversial Goldstone Report. During a recent panel discussion on "Civilians in War Zones" at Stanford University, Judge Goldstone mentioned that Ms. Pillay had requested the HRC to establish a Mission to investigate crimes likely to have been committed during the conflict in Sri Lanka and it is indeed notable that he courageously stated publicly that "to their shame" a majority of HRC members refused to do so. "fueled the long-standing and repeated complaints by Israel that the Human Rights Council and the UN in general are biased against it. They repeatedly rush to pass condemnatory resolutions in the face of alleged violations of human rights law by Israel but fail to take similar action in the face of even more serious violations by other States. Until the Gaza Report they failed to condemn the firing of rockets and mortars at Israeli civilian centers." “Below is my column from today on Egypt. Since I do not have an opportunity to write in public more than one column per week, I am limited to what I can say. I am extremely distressed by the crew in Washington, and in most European capitals. Media is so corrupted by left-leaning thinking that there is not much of an analysis to be expected in the media that is now competing with facebook, twitters, etc. The dumbing down of thinking is itself a huge problem the West is facing now as it tries pathetically to undertstand/explain politics and history of other cultures when it no longer has faith in its own civilizational values. I despair, and so I follow Samuel Pepys who confined himself to his diaries while London burned and I am trying to devote my time to reading and writing of my own (that of course I might not be able to publish, and even if published few will read). I am more convinced now, as I wasn't when Paul Kennedy wrote about the rise and fall of great powers, that the West has gone over the tipping point in its terminal decline. That intelligent people, or people who claim to be intelligent, (I have in mind the talking heads in the U.S. media such as Chris Matthews or Fareed Zakaria) cannot make the difference between the sham of the Muslim Brotherhood talking about freedom and democracy and the generic thirst in man to be free. These are the people who have like the Bourbons learned nothing and forgotten nothing. They are glibly about to put the Lenins of our time into trains heading for Moscows of our time, they find nothing odd that they are pushing for the Muslim Brotherhood to be taken into governing when everything needs to be done to keep the Muslim Brotherhood out even as one carefully negotiate the long historic transition of Arab societies from tribal autocracy and military dictatorships to representative rule and constitutionally limited government. I read you when I can, and I wish that you and others like you were closer to the main media control in the West, or in government. What's matter made of? Is there a God particle? How can physics explain life as we know it? These are some of the big questions theoretical and experimental physicists around the world are asking, and Israel plays no small role in finding answers. With its Large Hadron Collider, the world's largest and highest-energy particle accelerator built deep underground near Geneva, the European Organization for Nuclear Research (CERN) is helping shed new light on the deepest questions mankind has ever asked. Israel, relative to its size, has contributed for years in a disproportionate way to ongoing research projects at CERN. Now the CERN board has taken a major step in asking Israel to become a candidate for full membership in the world's most important particle physics research center. Serbia, Slovenia, Turkey and Cyprus were also asked to join the 20-country group. 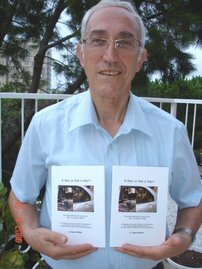 For Prof. Eliezer Rabinovici, chairman of the Israeli High Energy Committee and a researcher at the Hebrew University in Jerusalem, the move legitimizes decades of research that he and his Israeli colleagues have contributed to CERN, which he calls "the jewel in the crown of European physics." "First of all, it's recognition for the fact that Israeli high energy physicists, experimental and theoretical, have made significant contributions to the field in general over the years, and at CERN in particular," says Rabinovici. "I think this is a badge of honor, and a recognition of everything [we've] done." As CERN changed its rules of membership, member states were asked to decide which significant contributors should be invited to join. While Israel is geographically situated in Asia, and is regarded as part of the Middle East, it is most often classified in research and development as part of Europe - sometimes formally, other times informally. In as little as one hour, an Israeli scientist can fly to Greece and within three or four to Switzerland. Full membership means full voting rights, and - of particular interest to Israeli businesses - access to tenders above the half-million dollar mark. To see if Israel has the right stuff, a CERN investigative team came last May to determine if Israeli industries could be useful for CERN today and in the future. They were looking for highly specialized welding, fiber optics and high-tech software in particular. "They reported on the scientific capabilities of Israel and its industry and came back with a very good report," says Rabinovici. Though Israel is not typically into what he calls "big science," mainly due to the financial commitment required, CERN membership will give Israel an instant upgrade in the scientific community. To join the ranks as a full member, Israel will be asked to contribute a sum in proportion to its gross domestic product, which would be roughly $10 million per year. But given the prospective dividends in tenders, it could very well turn out to be a lucrative deal, Rabinovici says. The same was true when Israel joined the EU research community. Since then, the required investment has paid for itself. The Middle East is likely to plunge into serious humanitarian crisis due to depletion of water resources, unless remedial measures are introduced urgently, says a new Strategic Foresight Group report, and reported in a newswire from Mumbai. The report prepared by the Strategic Foresight Group, with support from the Swiss Agency for Development Cooperation and the Swedish International Development Cooperation Agency, and input from almost 100 leaders and experts from Israel, the Palestine Territories, Jordan, Lebanon, Syria, Iraq and Turkey, also says that water crisis can be converted into an opportunity for regional peace. The rivers that flow in Turkey, Syria, Iraq, Lebanon and Jordan have been depleted by 50 to 90 per cent from 1960 to 2010. The annual flow of the Yarmouk River declined from 600 MCM to about 250-300 MCM, while the Jordan River has declined from 1300 MCM to 100 MCM. The water level in Barada River Basin in Syria has dropped from 50 meters below ground in 1990 to 200 meters at present. The renewable freshwater resources in the Mountain Aquifer, shared by Israel and the Palestinian Territories, have been reduced by 7 per cent since the Oslo Accords in 1993 and in the Western Galilee Aquifer by 15-20 per cent. This is assuming full recharge in a normal rainy year. The water level in the Dead Sea dropped from 390 metres below sea level in the 1960s down to 420 metres below sea level at present and will be 450 metres below sea level by 2040. The water surface area has shrunk by a third, from 950 square kilometres to 637 square kilometres. If the surface water level in the Dead Sea continues to erode, it will be reduced to a lake in 50 years, and will eventually disappear altogether. Thus there must be a sustainable water management in Turkey, Syria, Jordan, Lebanon, and Iraq, building on cooperation between these countries in trade, transit, and energy. A Cooperation Council will enable the countries to have common standards for measuring water flows and quality, develop regional models for combating climate change, spread new technologies, and facilitate basin level integrated water management. The report also proposes confidence building initiatives between Israel and the Palestine Authority to agree on the status of water resources and method of functioning of the Joint Water Committee. It recommends decentralised waste water treatment plants for the Palestine Territories. In the long run, it recommends that the threatened water bodies be managed as Regional units and the export of the waters from the Turkish national rivers via the Mediterranean to the Jordan Valley countries. For the interest of all peoples in the region surely this makes sense? In Israel there is Free Speech!! This week there is a major conference in Jerusalem of European lawmakers and politicians who are members of an organization called “European Friends of Israel”. Unlike many such speeches today in places such as Edinburgh University, Rutgers, and other locations that are interrupted and subsequently cancelled because groups who claim to be working for “human rights” won’t allow people to hear any view except their own, this speech was not interrupted. I learned that 2500 years, ago the Greeks took the ropes of the bridge across the Bosporus. They burnt the bridge after they won the war against the Persians. They took the ropes and put them in the Acropolis, in the Parthenon, as a testament to their values, the values that they safeguarded in the battle for freedom. So there were two sources of freedom for Western civilization that grew out of these two places. One was in Athens and the other is in Jerusalem. People say, “well, you don’t really have an attachment to this land. We are new interlopers. We are neo-crusaders.” If I could I would invite each of you into my office. You would see a display of antiquities from the Department of Antiquities. And from the place next to the Temple wall, the Western Wall, from around the time of the Jewish kings, they found a signet ring, a seal of a Jewish official from 2700 years ago, and it has a name on it in Hebrew. You know what that name is? Netanyahu. Now, that’s my last name. My first name, Benjamin, goes back a thousand years earlier to Benjamin the son of Jacob who with his brothers roamed these very hills. So we do have some connection to this land, but we recognize that others live in it too. We want to make peace with them but we have this basic millennial connection to this land. Part of the campaign against Israel is the attempt to distort not only modern history, but also ancient history. It is said that “There was no Jewish Temple” – did you hear that one? Well, I’d like to know where were those tables that Jesus overturned? Were they in Tibet? There’s an attempt to rewrite history – ancient and modern and to deprive the Jewish people of their connection to their ancestral homeland and this is why I so welcome the fact that you come here to Israel, to Jerusalem – perhaps next time to my office. .
By participating in a voluntary medical delegation to India, two Rambam doctors put broad smiles on the faces of more than 200 patients with congenital facial defects. Sponsored by the organization Operation Smile, the delegation provided corrective surgery to people of different ages who had been born with cleft lip or cleft palate. The operations relieved patients of both physical limitations and social stigma. At the end of December Dr Itzhak Ramon, a senior physician in the Department of Plastic Surgery and Dr Zach Sharony, who is completing his specialization in plastic surgery, returned from a medical mission to Assam in northeast India. Their delegation was sponsored by the international charity organization, Operation Smile, which is devoted to correcting congenital facial defects, like cleft lip and cleft palate, in places where medical help is limited. For ten days, more than 50 medical personnel from around the world treated more than 200 patients ranging in age from six months to the mid-forties. The multi-disciplinary team included plastic surgeons, dentists, anesthesiologists, pediatricians, nurses, and speech therapists. According to Dr Ramon, this was a mission in the truest sense of the word. “These operations improve the health and quality of life for many patients who would otherwise be unable to attain or pay for such treatment,” he says. Likewise, the team benefits from a sense of great satisfaction, and from coping with unusual medical situations. “I learned a great deal in India – all the doctors share their knowledge and everyone learns from everyone else,” says the plastic surgeon.Dr Ramon first went on an Operation Smile mission in the Philippines over 10 years ago. “The experiences I had there as a young surgeon are still very much alive for me,” says Dr Ramon. “This time I was able to participate as an experienced doctor.”Upon their arrival to India, the Rambam doctors met their colleagues and set out together for the city of Guwahati in Assam. “When we arrived at the local hospital, hundreds of people were already waiting,” recalls Dr Ramon. “There are not enough surgeons or resources there to perform these operations, so Operation Smile decided to send four medical missions there yearly,” says Dr Ramon.